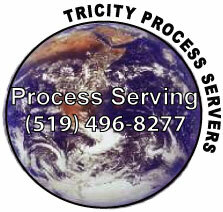 Professional Process Serving In Canada. Through our day-to-day services, our committed community relationship, and our professional affiliations, Tri-City Process Servers is dedicated to setting new standards in the process serving industry. In 1993 Robert Kaus graduated a three-year degree in Business Administration at Mohawk College. From there Robert opened well-run successful business operations in the Golden Horseshoe (4). For the Past 15 years he has provided to hundreds of thousands of satisfied customers in the Retail, Restaurant, and Service Industry. Some of the customers he provided for range from the guy next door to Canada’s largest retailer. Robert is a now a resident of Kitchener Waterloo, and is dedicated to the Quality of Excellence in everything he does. In the past year he has decided to open another business what we know today as Tri-City Process Servers. "We are a professional process serving company with only 1 goal. Proven Success."